From high profile major international tournaments to local club amateur scrambles, golf offers something for every level player or fan. There are a variety of formats for golf tournaments, but the majority of them rely on only a few different types of competition. In most events individual players all compete against each other for the lowest total score. Some tournaments involve a series of individual matches between two golfers. Players can also be grouped into teams and compete against other groups in one of several different ways. The most common tournament format is individual stroke play, also called medal play. It is the overwhelming choice for professional events as well as local amateur tournaments. Out of more than 40 events each year on the PGA Tour, all but one is a stroke play event. The winner in this format is the one with the lowest overall score, either for a single round or for a number of rounds. In most amateur events the scores are net scores based on the players’ handicaps, but professional and high-level amateur tournaments use gross scores. Match play consists of a series of one-hole contests between two players, and the one who wins the most holes over the round is the winner. 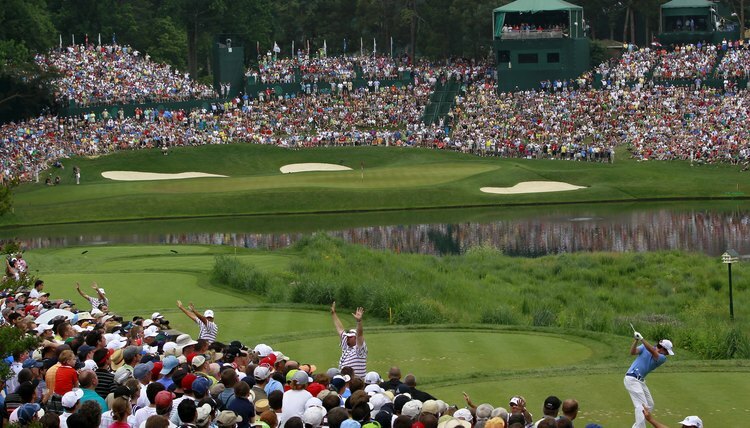 With a large field of golfers, many matches are required to decide a winner. Once the preferred format for high-level competitions, there is now only one match play tournament each year on the PGA Tour. The United States Golf Association and regional amateur golf associations still conduct many of their championships using match play. A less common individual competition format is Stableford, where players win points for their scores on each hole. The player with the highest point total at the end wins the event. Up until 2007 there was one Stableford competition on the PGA Tour. Some competitions involve two or more golfers playing together as a team. The most common form of team play is the four ball, or better ball, competition with teams of two players. Only the lower score of the partners counts on each hole. Teams usually compete against all the other teams in medal play using either gross or net scores. In some tournaments like the international Ryder Cup competitions, teams play against each other in match play, and sometimes play “foursomes” matches where the two teams alternate shots and play only one ball. A popular format used in less formal tournaments is the scramble. It is a team competition that is suitable for players of vastly different skill levels. Teams usually consist of four players. For each stroke the team members select the best of their previous shots and all play their next shots from that position. The procedure continues until someone holes their ball. The event can be handicapped but it is difficult to do in a fair manner. There often are limitations on the skill level of players allowed on the same team and the number of drives required from each player.